Bday cake, swappy fun, and sweetness from blogland! Aaron thanks all of you lovelies for the Happy Birthday wishes!! We had a great day! We did have one little wrinkle in our plans though...our favorite Indian place is closed on Monday!! Boo Hoo!! The frowns didn't last too long...we decided to go to a fabulous Thai place called Siam Garden. Ohh the food is just tooo good!! Missy and her boyfriend Adam joined us. Missy insisted we get the "party room"! This was funny being that it was only the FOUR of us and the room is usually reserved for like 8 to 10 people. But it was a slow night and they gave us the "party room"...it was fun in that slightly embarrassing way. Aaron hemmed and hawed for a couple of days and finally decided on a carrot cake. I've made it for him before, it's a drop dead recipe. I wanted to dandy it up with some marzipan carrots etc... but Aaron likes a classic, dressed down homestyle cake. In the morning Aaron went to Costco with his mom and they got new cellphones which are way too technically advanced for the both of 'em. (Aaron is strictly a paint, glue and scissors man). Usually we do all day affairs for birthdays, like trips into NYC or scouring the Jersey and Pennsylvania countryside for antiques and junk. 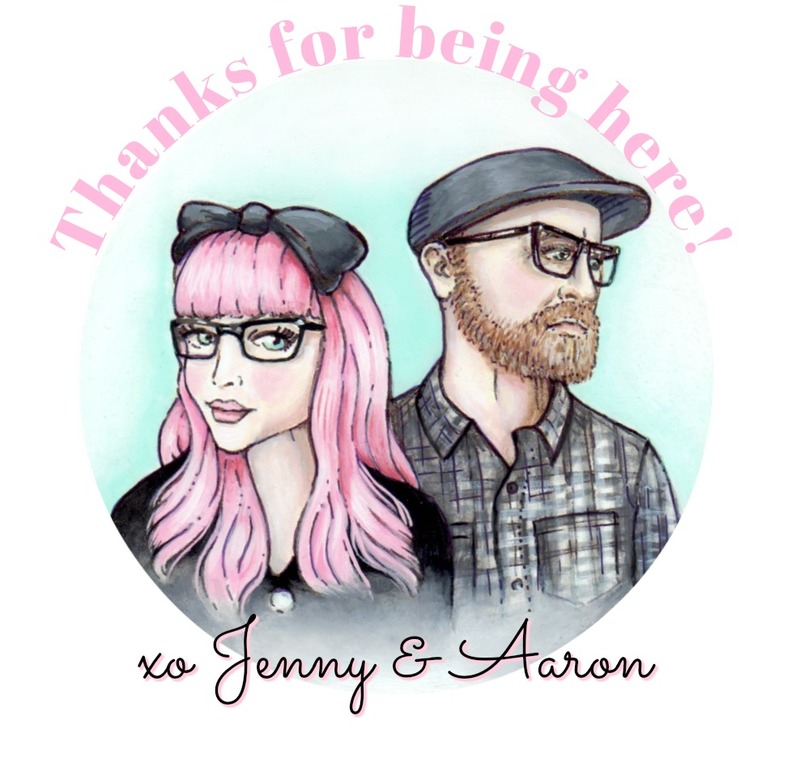 But we had a bunch of work to do and I think Aaron secretly likes us to approach his b-day with very little fanfare just so when my b-day and Missy's b-day come around he can sulkily say "well we didn't do anything on my birthday." Well, after dinner we did cake at the Heid's and then went to one of Walt's Flames Games. The Flames are his roller hockey team. The games are always way too late at night and really really funny. Walt is sixteen and all the guys in the league are nearing thirty years old. He flies around them like a gnat. When the older guys get rough with him out of frustration we tell Walt to tell them " dude, you got a mortgage to pay and I have a math quiz in the morning, go easy on me." Danielle Muller. (aka the Vintage Dragonfly) They are actually tiny versions of our 100% original girl and cake paintings embellished with some patterned papers, crepe paper, cupcake wrappers and glitter. They look so fun this scale! 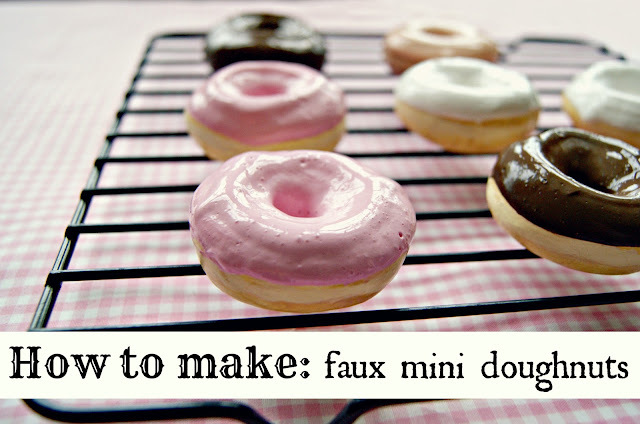 The mini cakes and cupcakes are my favorite! I hope that the gals who receive them like them! I myself cannot wait to see all of the different styles, and ideas! We will be getting 3 back. I will be sure to take pics of them as soon as they arrive! Oh, and we are totally gonna do new versions of these that are a bit less time intensive so we can offer them for sale as a set. Ok...and now I must tell you about my blogland friend Heather Bullard!! What an amazingly sweet, generous, and super duper stylish doll she is!! (You must must must check out her blog) This oh so sweet box of pretty pink goodies arrived the other day on my doorstep! 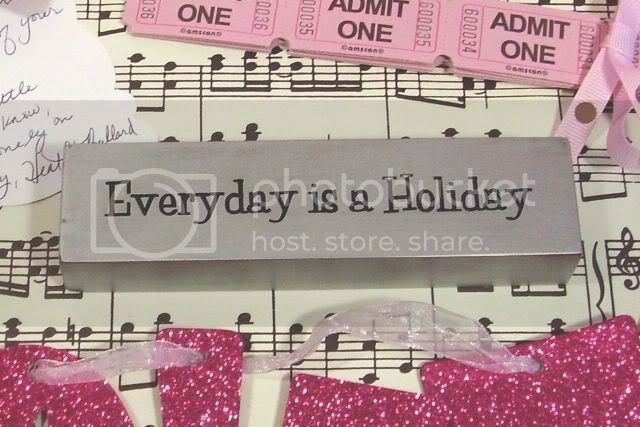 Heather had been out shopping with her daughter and came across this little sign which read ..."Everyday is a Holiday" she said that she immediately thought of me and just had to buy it for me! My goodness!!! Toooooo sweet!! Oh....and she just couldn't possibly send it alone!! So I received a box full of lovelies!! Deeelish chocolates from Trader Joes, a cute cute sparkly heart box full of dove chocolate hearts, pink"admit one" tickets! 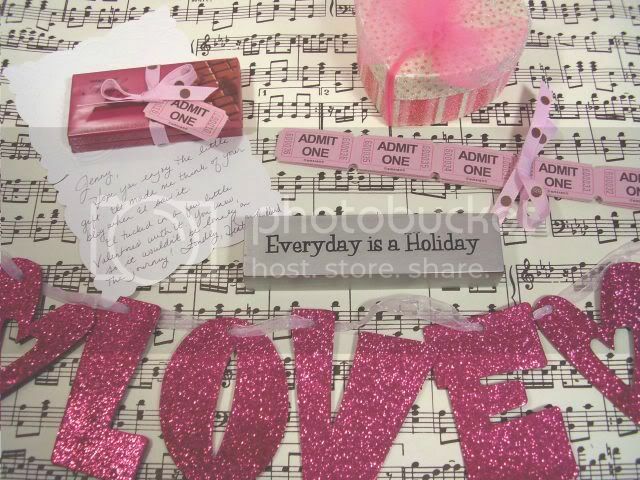 (perfect for all sorts of things), a Bright pink glittery "LOVE" garland, and a sweet sweet handwritten note! And boy oh boy, the presentation/wrapping/magic handiwork was beyond top notch. What an absolute sweetheart!! Thank you SO SO much Heather!! Truly so kind! 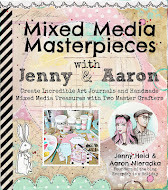 Both Aaron and I LOVE everything to bits! We are hard at work on all sorts of fun new things...I promise a preview soon! What a gorgeous cake. Carrot is one of Rocky's favorites too. Happy (belated) Birthday Aaron!!!! And those paper dolls and the packaging.... LOVE!!!!!!!!!! You have to be one the most talented artists I've ever had the privilege to meet. Your work is just stunning!!! Amazing amazing amazing!!! Hi Jenny!! That cake looks scrumptious!!! 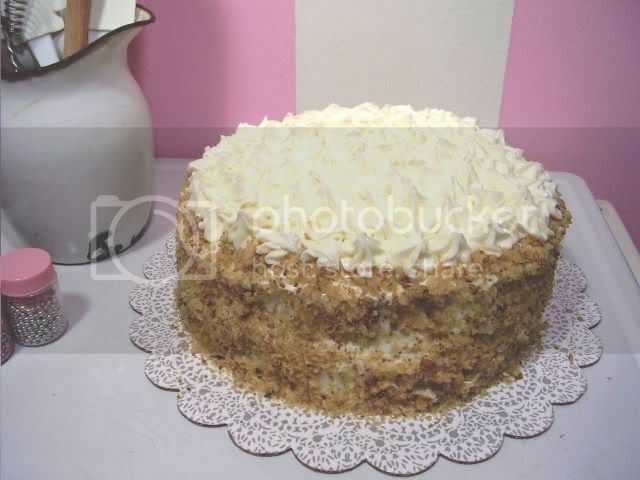 Carrot Cake is a favorite around here...especially if it has cream cheese frosting. 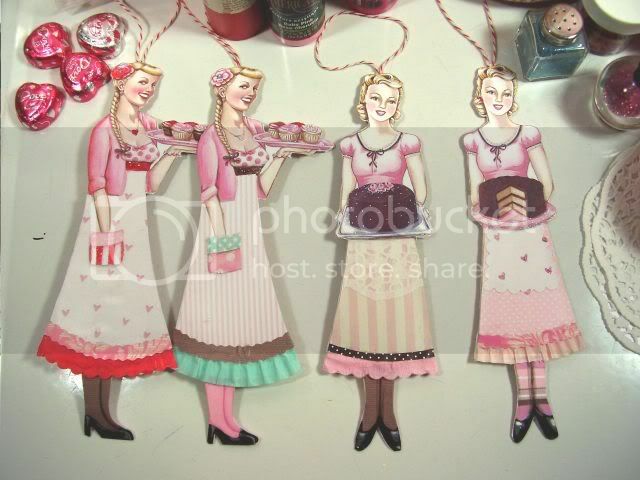 AND, I love the adorale paper dolls! The one with the braids is you!!!! Hi Jenny, Wow - carrot cake with cream cheese frosting is def. my fav. cake-cake (not counting cheese-cake! )...so lucky Aaron - happy belated b-day! 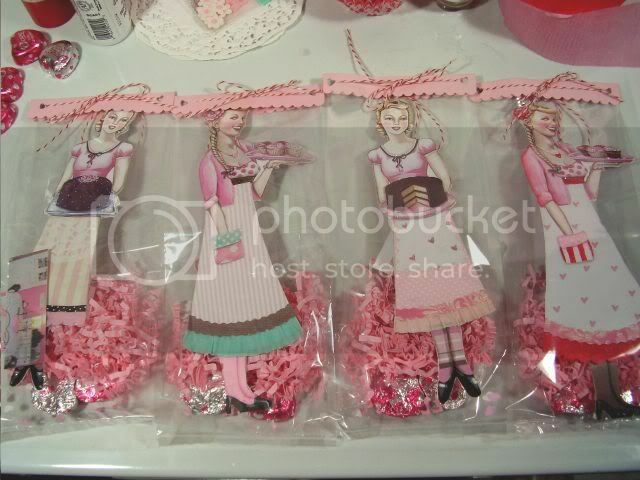 Really love your valentine goodies - the ladies with the bags are just too cute - lucky receipients! And I love the glittery banner - I'm assuming homemade? And can you tell me where you found the beautiful pink cake plate with the scallopy edges? Martha has one and I've been all over trying to find a similar one. Your paper dolls are just plain DELICIOUS!!!!! And that cake....oh my...I am drooling. Glad the celebration was such fun. and I agree with your friend....Everyday Is a Holiday....at least it should be!!!! hi - I love your blog - all that pink and YUMMINESS - its taken awhile to be accepted by the blog guards - but at last !?! - every thing you do is truly DELIGHTFUL!!!!!!!! - please do come visit me - and you can be sure that I'll be back - xox - eb. I want my own Jenny doll! She's such a beauty holding that yummy cake!!! I LOVE this new stuff!!!!! Roller Derby...now that would be a blast! Oh my goodness...your dollies are just WAY TOO CUTE!!! I absolutely adore them:) I'm sure the recipients will be thrilled. Funny, I just found Heather's blog this very morning. 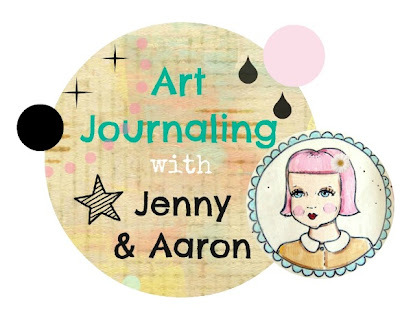 Small blog world it is! Thanks for all the eye candy. Glad Aaron had a good bday. Happy Belated Birthday to Aaron! That cake is beautiful, wish I could have had a slice...oh...wait...I had plenty here celebrating my Mark's birthday the same day! Cuteness as usual Jenny! Can't wait to see how your brooch for the swap turns out! Thank you for the links. I visited some of your friends. Love the Paper Dolls!! The two on the left look like that pic of you. You are darling and fab. So glad I found my way here!! every morning I'm thinking to myself now, "hum...wonder what the lil' Jenny is up to now?" I just have to go to ur blog...I'm always marveled! I love the paper dolls is that you? Finally I can post a comment, just open an account so tell you how much I love your blog and Artwork. Thank you so much for your sweet words on my blog. I Loooooooove those paperdolls, they are AwSOMe.